Much like theories, parameterized tests take a number of possible values and apply them to methods in the test case. Unlike theories, however, parameterized tests pass or fail individually, meaning that one specific data point can fail while the others pass. While Theories are best used for reversible or mathematical concepts, parameterized testing allows for passing a series of arguments and expected results to every test in a case, some tests in a case, or each to a unique test in the case. Theories are best used for reversible operations that must succeed in every single situation. For example, a great use of a Theory might be testing a date conversion utility. Perhaps you have a class that converts dates from Gregorian calendar dates to dates on the Buddhist calendar. Using a theory, you would supply hundreds or thousands of Gregorian dates as data points. For each data point, you might convert the date to the equivalent Buddhist date. You would then convert each Buddhist date back to the Gregorian date and ensure it matched the original. This type of reversibility is the hallmark of a good theory case. This use of data point combinations starkly contrasts the use case for Parameterized testing that you will learn in the remainder of the lesson. Parameterized test cases, like Theories, have methods that accept parameters. However, that is where the comparison ends. Parameterized testing gives us a way to create tests that will use a multitude of known parameters and results. The intention of the Parameterized test is to eliminate the need to copy and paste the same test multiple times, simply changing the input values. Parameterized tests require the Parameterized runner included with FlexUnit 4.1 and later. To use the parameterized test runner, add the RunWith metadata to the class definition. 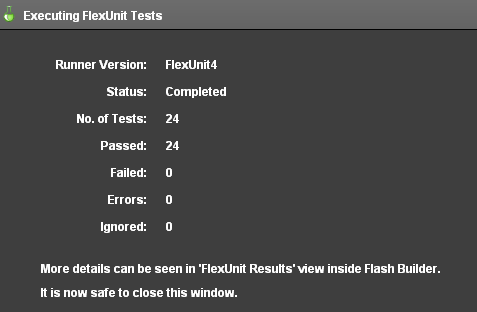 There are actually two types of Parameterized tests supported by FlexUnit 4.x, which you will learn to use next. To use any form of parameterized tests requires a custom runner. 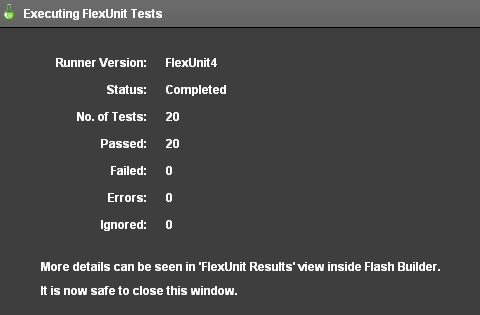 FlexUnit 4.1 includes the ParameterizedRunner which can run TestNG and JUnit style parameterized tests. Any type of data can be used in parameterized testing. In fact, some of the most effective testing can occur when you begin using entire objects as the parameters to methods. The following examples are all valid and intended to make you consider how polymorphism and complex types can enhance your testing capabilities. Create a new class to run tests with parameterized data. Apply the TestNG style of parameterized testing. Import the FlexUnit4Training_wt1.fxp project from the Unit 11/Start folder. Please refer to Unit 2: Walkthrough 1 for instructions on importing a Flash Builder project. Create a new ActionScript class named GetPointsTest.as in the math.testcases package within the tests folder. Mark the GetPointsTest class definition with [RunWith("org.flexunit.runners.Parameterized")] metadata. Add a private static constant named TOLERANCE of data type Number to the class. Set TOLERANCE to .0001. Declare a public static array named data within the GetPointsTest class. The array should contain a sub array with point values as shown. If you did not use code-completion, add the import for net.digitalprimates.math.Circle and flash.geom.Point at this time. The data array contains two arrays. Each is passed as a set of parameters, and each represents one run cycle for the tests that take the data. Soon, you will write a method which takes 3 parameters, a circle, a point and a number of radians. That test will run twice, one run using the first array and another using the second. Add a public method named shouldGetPointsOnCircle() to the class. Mark the method with the [Test(dataProvider="data")] metadata. Add a circle parameter of type Circle, a point parameter of type Point, and a radians parameter of type Number to the shouldGetPointsOnCircle() method. The [Test(dataProvider="data")] metadata over the test method will ensure that the data array's values get passed in as the test method's arguments. This is known as TestNG style parameterized testing, because the data is passed into specific test methods via the metadata. TestNG is a testing framework for Java, it pioneered this annotations-based approach. Add a call to the assertThat() method. Pass circle.getPointOnCircle( radians ) and new CloseToPointMatcher( point, TOLERANCE ) as its arguments. If you did not use code-completion, add the imports for org.flexunit.assertThat and matcher.CloseToPointMatcher at this time. The shouldGetPointsOnCircle() method uses the assertThat() statement with the CloseToPointMatcher to create the same kind of test coverage presented in BasicCircleTest class through the shouldGetTopPointOnCircle() and shouldGetBottomPointOnCircle() methods. Open the CircleSuite.as file in the math.testcases package. Add a public variable named test6 of type GetPointsTest. Add another parameterized test to the GetPointsTest class. Apply the JUnit style of parameterized testing. Open the GetPointsTest.as file located in the math.testcases package within the tests folder. Alternatively, if you didn't complete the previous lesson or your code is not functioning properly, you can import the FlexUnit4Training_wt2.fxp project from the Unit11/ start folder. Please refer to Unit 2: Walkthrough 1 for instructions on importing a Flash Builder project. Add three private variables to the GetPointsTest class. One named circle of type Circle, another named point of type Point, and another named radians of type Number. Remove the (dataProvider="data") portion of the metadata from the shouldGetPointsOnCircle() test method. Also remove the parameters, as they will be replaced by the instance variables just created. Add a public function named shouldReturnDistanceEqualToRadius() to the class. Within the new method, declare a variable named distance of data type Number. Set it equal to Point.distance( circle.getPointOnCircle( radians ), circle.origin ). Add a call to the assertThat() method. Pass in distance and equalTo( circle.radius ) as its arguments. If you did not use code-completion, add the import for org.hamcrest.object.equalTo at this time. Now you will need to create a class constructor function that assigns the parameters to the variables declared above. It will take in a circle , point, and radians parameters and assign it to the instance variable for each. Mark the data array with [Parameters] metadata. In the previous walkthrough, parameters were passed in using the dataProvider="data" metadata. In this case, parameters are marked with [Parameters] metadata, which passes them into the constructor before each test method is run. This is the parameterized testing approach used in JUnit, a popular Java Unit testing framework on which FlexUnit bases much of its syntax. External data for parameterized testing is similar to external data in theories. All external data sources use a dataloader, which must implement the IExternalDependancyLoader interface. For more info on loading external data, see Unit 9: External Data. Load parameterized data from an external XML file. Apply externally loaded parameters for greater test coverage. Open the GetPointsTest.as file you created in the previous exercise. 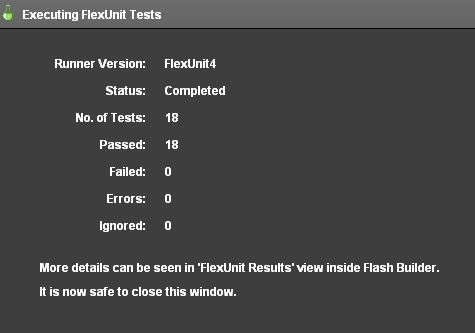 Alternatively, if you didn't complete the previous lesson or your code is not functioning properly, you can import the FlexUnit4Training_wt3.fxp project from the Unit 11/Start folder. Please refer to Unit 2: Walkthrough 1Unit 2: Walkthrough 1 for instructions on importing a Flash Builder project. Add a public static variable named getDataPointsLoader of type GetPointsDataHelper to the GetPointsTest class. Instantiate the GetPointsDataHelper passing it a the argument "xml/circlePoints.xml"
If you did not use code-completion, add the import for helper.GetPointsDataHelper at this time. The GetPointsDataHelper class implements IExternalDependencyLoader and IResponder interfaces. It is able to send and receive a data request in test case preparation. The loader itself references a data provider. In a parameterized test case, a static array uses these test parameters. The use case of Parameterized testing and Theories is different. Parameterized tests pass entire sets of arguments to a method. Theories define possible combinations. Parameterized require the RunWith metadata [RunWith("org.flexunit.runners.Parameterized")]. Public static arrays containing arrays of arguments feed data into test methods and constructors depending on the style. Two types of Parameterized testing: TestNG and JUnit. TestNG Style - Declares a dataProvider per test method, therefore allowing different tests to use different data. JUnit Style - Instantiates parameterized data to instance variables within the class constructor. Complex objects can be passed as parameterized data. External data can be loaded for parameterized testing with a custom loader. The loader classes used for parameterized testing are created in exact same way as those used for theories.